Welcoming, comfortable,convenient,well equipped and presented. The Cottage is adjacent to the chain ferry linking with the sailing town of Cowes. 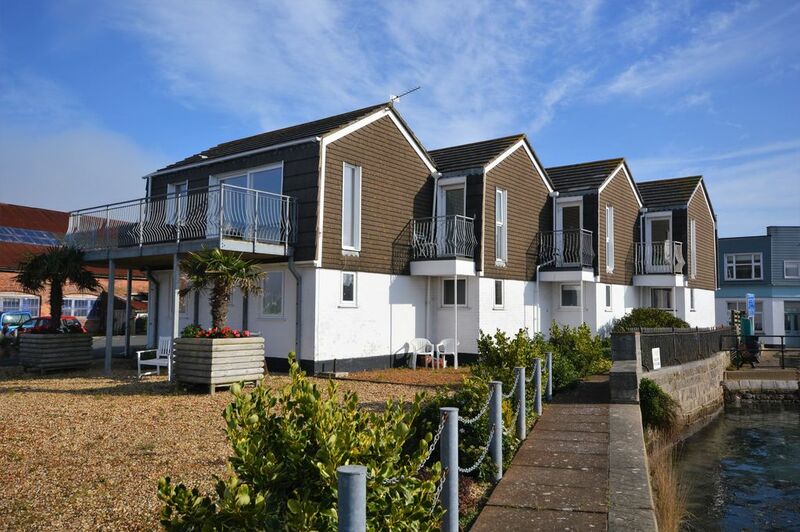 The cottage is located right on the river so you can relax in this coastal setting and enjoy the constant marine activity with fantastic views over the passing yachts from either balcony. The Esplanade stretches the length of the beach and on the opposite side there is a green, an adventure playground and paddling pool and a caf&eacute; selling a variety of food and beverages, which is also a great vantage point to watch the spectacle of boats and yachts as they navigate Cowes Harbour and pass through The Solent. Osborne House, Queen Victoria's family home, is a must visit whilst on the Island and is one of the most popular tourist attractions on the Isle of Wight. After first visiting Osborne, England's longest-reigning monarch wrote: 'It is impossible to imagine a prettier spot'. Within a couple of minutes walk of the property there is a couple of great restaurants, an Indian (Taste of India) and an Italian (Prego) and for more 'every-day' family dining, a short walk to East Cowes Marina you will find the Lifeboat, which boasts an elevated, west facing deck from where a meal or a drink can be enjoyed in the sun, overlooking the marina and the variety of stunning boats in it berths. Anchor Cottage is in the perfect spot for use as a base-camp for exploring the many treasures that the Isle of Wight has to offer. Situated right on the waterfront in East Cowes and with easy access for Red Funnel, the Chain Ferry/Floating bridge -https://www.iwfloatingbridge.co.uk/timetable/ water taxis and local transport links &ndash; you can't really get a more convenient spot. Just sit on one of the two balconies or on the water's edge terrace to enjoy an al-fresco meal and a drink as you watch the world go by from your private, waterfront vantage point. We very much enjoyed our stay at this lovely little house. Great views of the constantly changing river and although there is some noise from the chain ferry we didn't find it at all irritating. Nice to be welcomed with biscuits, tea bags, spare toilet rolls etc. Very warm, comfortable and homely. Anchor Cottage gave us all that we required....lovely views across the busy water where we relaxed watching the chain ferry, commercial and private boats going about their business. Facilities in the cottage were ideal and especially a very comfy bed! We have been to the IOW many times so have visited most of the attractions over the years so this holiday was purely relaxation and change of scenery. The one thing that did cause us a problem was the key safe on the outside wall of the cottage. We tried for quite a while to open it with the key code but without success. Fortunately a neighbour came over and he eventually was able to get it open but he commented that it was very fiddly and probably a new safe was required. We then had the same problem when we came to leave, we couldn't get it open to return the key! The neighbour wasn't available so we had to leave the key in the locked post box on the outside wall of Anchor Cottage where it would be safe. We did let Island Holidays know what we had done and they were going to contact the owner.